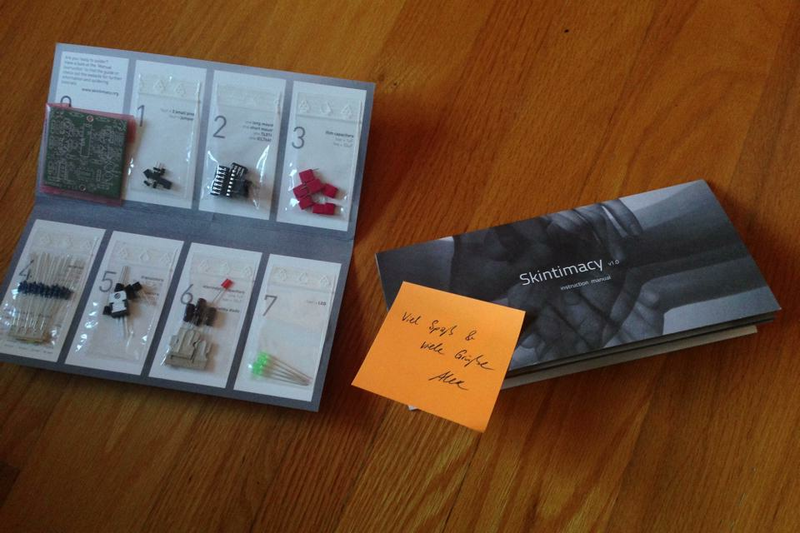 Skintimacy is a board designed by Alexander Müller-Rakow, that allows to measure some conductance between one master and 4 slaves/players. It is designed with the idea of using it between 5 people touching each other, but the master and/or the players could be objects. For examples of project with the Skintimacy visit Skintimacy project page. Using Skintimacy with a Teensy, it is possible to create a MIDI instrument that will be detected as such by any music software. So, now, touching each other would be a MIDI controller, more contact with the other, you get a higher controller value, allowing to you add an effect, have more distortion on a sound, playing a MIDI note or a sample, pitch shifting a voice or whatever your ideas bring you! This project gives you 4 MIDI controllers, each value depending of how much contact each player has with the master. For this project you will need a Skintimacy board and a Teensy board. If you can get a Skintimacy kit from Alexander Müller-Rakow, it is a bijou kit. Put Skintimacy kit together and connect Out 1, 2, 3, and 4 to 4 Analogue inputs on the Teensy. You need to connect the ground from the Teensy to Skintimacy ground too (in -). Download Arduino IDE, if you do not have it already. Plug your Teensy board to your computer. Open the .ino file you downloaded. Make sure Analog input pins are the one you connected the Skintimacy to, and make sure the Midi controller numbers are the one you are going to use. In Arduino IDE Tools menu, under Board, choose your Teensy board. In Arduino IDE Tools menu, under Serial, choose appropriate serial port. In Arduino IDE Tools menu, under USB, choose MIDI. Wait until it says "Done uploading." Quite Arduino. Unplug the Teensy. Plug it again. Open Midi preferences of your system. Teensy MIDI should be there. Open Max SkintimacyMidi.maxpat. If you do not have it, open any music software that can send MIDI, such as Ableton Live. Choose Teensy MIDI as MIDI instruments. Choose the controller numbers you used in the code Arduino code. If you'd like email coaching or if you'd like me to add some features or you want me to adapt this work for your project those are service I offer. If you fancy contributing to my work, that is always appreciated!